I’ve always been surprised that Little Tokyo (or LA really, for that matter) didn’t have any udon specialists. Ramen is big here, of course, but there aren’t any shops dedicated to the thick, white noodle (I have heard there are a couple in Gardena/Torrance though). 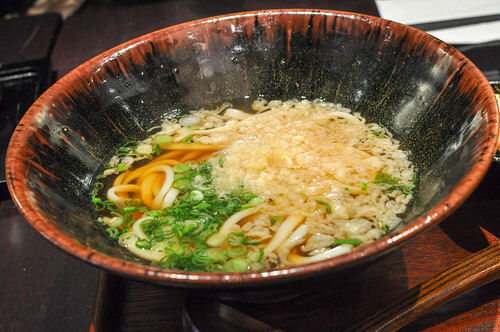 Whereas ramen is typically served in a richer, fattier broth (pork-bone tonkotsu, soy sauce shoyu, miso, and salt shio are most popular in LA), udon is usually served in a much lighter dashi-based clear broth. Of course, most of the jack-of-all-trades Japanese restaurants serve their variation of the noodle soup, but it’s typically in very basic form using frozen or dried noodles. In fact, it was in one of these do-all Japanese restaurants where I fell in love with the thick, chewy noodle at a young age. Tempura udon (tempura on the side) was one of my favorite dishes growing up, back when I thought ramen came in packages of dehydrated noodles with an oh-so-addicting salty seasoning packet. However, just in the past couple of months, two udon specialists have opened up shop in Little Tokyo featuring fresh, handmade noodles and a menu centered on (if not exclusively on) the noodle. Tsurumaru Udon opened in February in the quiet Little Tokyo Galleria Mall, serving a cafeteria-style menu often seen in Japan. 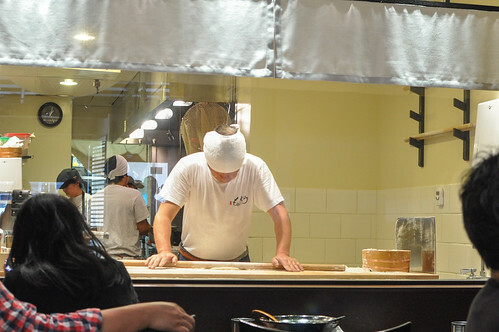 You pick a base udon, a size, and customize toppings and are usually eating within 5-10 minutes of entering. It’s cheap, quick and they make a very satisfying bowl. 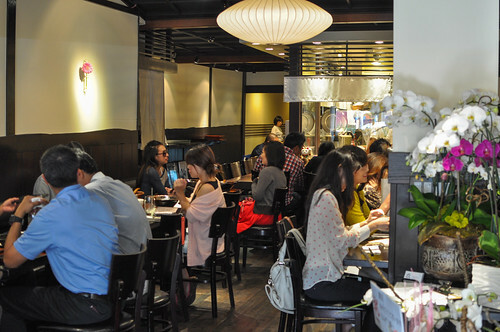 Marugame Monzo, next door to ever-popular ramen joint Daikokuya, replaced Fat Spoon last month with a sit-down affair. 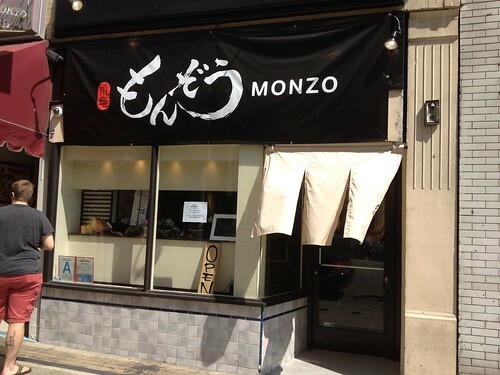 Marugame Monzo’s menu features about a dozen hot ramen and half-dozen cold ramen with even some ‘salad udon’ options. Not really sure what that last one is. They also have a handful of rice bowls (which I’ve heard are quite good), but I was here for the udon. 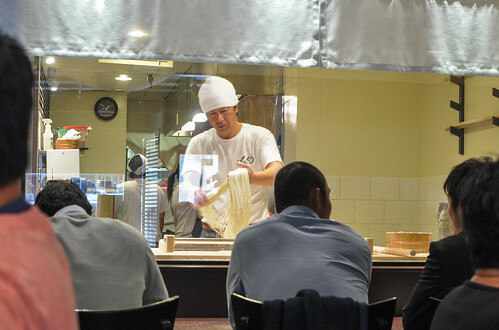 While here during lunch, a fresh batch of noodles were prepared three times. Clearly, the noodles were as fresh as you’re gonna get. I’m always enthralled by any kind of noodle-making, so this was definitely quite the sight. The classic dish of my childhood, though this one was done much better. 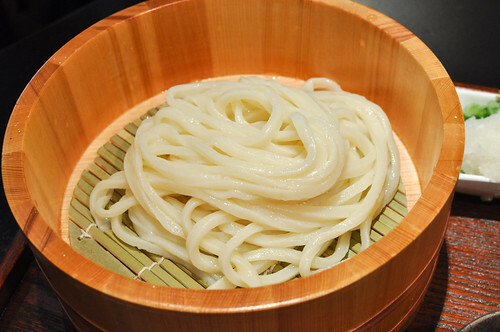 Long strands of the thick noodle held their characteristic, addicting chew that I love, sitting in a hot comforting broth. Chopped scallions and crispy tempura pieces floated in the soup while the shrimp tempura were excellent as well. Served on the side by default, they were plump sweet pieces of shrimp in a crispy, light batter. I loved the presentation of this udon. 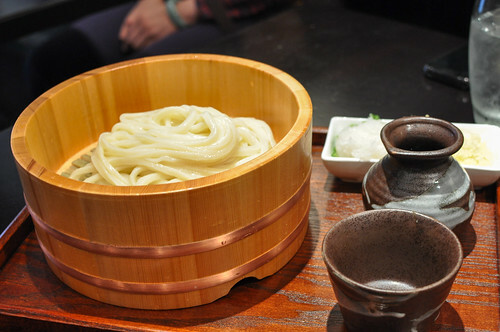 Served cold, the udon showed off even more of its chewy texture – cooked perfectly. 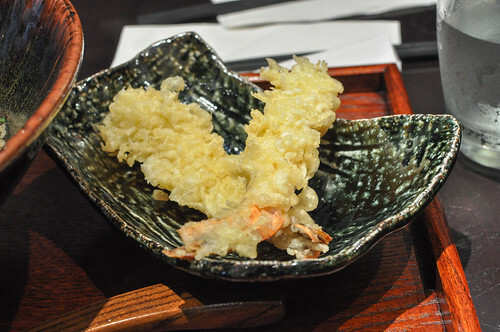 A side sauce complemented with grated radish, scallions, grated ginger, and fried tempura chips completing the simple dish. This was definitely something different for me, but apparently something my Japanese coworker had seen before. This was basically a take on the classic French preparation using the thick noodle; bits of chicken were added in to make it more of a complete meal. As expected, this was rather rich and kind of heavy and the noodles didn’t hold up their chew quite as well. It wasn’t bad at all, but not really my thing…I prefer the lighter preparations for udon. Interesting! A friend of mine who is originally from Japan was just raving about this place, so I assumed it was legit, but it’s nice to hear it from you too. 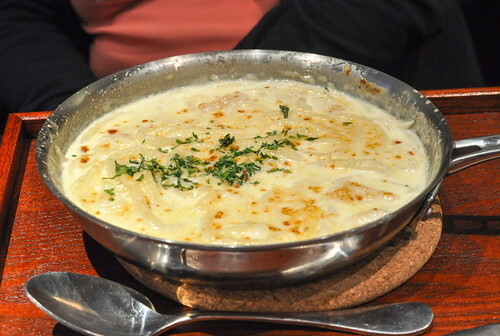 I don’t know about udon gratin, but I’d definitely like to check this place out. Also, I love that you can watch them making the noodles! Haha yeah stick to the more traditional items, at least for the first visit. 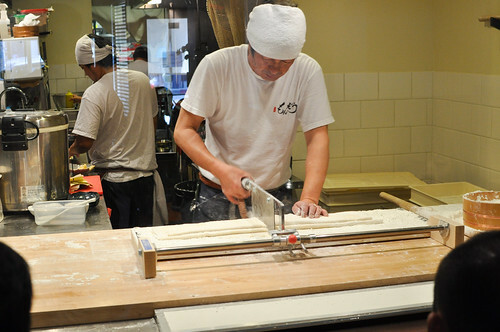 For sure, super cool that you can see the noodles being made! Don’t think it needs to be on your list if you’re just visiting for a few days…but if you’re really craving udon it’s a good spot! can’t wait to try this spot! Can’t wait for your post!